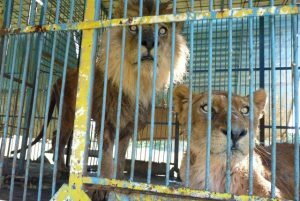 Salteña had been abandoned by a circus in 2011. She was severely malnourished when she was taken to the Mendoza Zoo. Years later, she lost the companionship of the male lion she’d lived with for years. He recently died at the zoo. 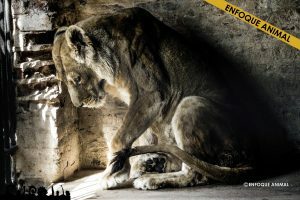 An animal welfare group in Argentina reached out to us to see if we could take in the last two remaining lions at the Mendoza Zoo – Salteña and Chupino. The 13 other lions had already died there. This zoo is built in the mountainous region of Argentina. It’s very old, built on a mountain slope and had been abandoned for some time. Animals weren’t spayed or neutered, so thousands have been in cages at the zoo. Since there was only one outside area, Salteña had to share it with the zoo’s last male lion, Chupino. When he was outside, Salteña spent a lot of her time in a small, dark cage in the mountainside. 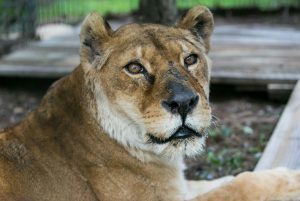 Salteña’s a geriatric lioness, estimated to be in her mid 20’s, like our Shanti Deva. But the differences couldn’t be more striking physically. Salteña’s had a very tough life. We were concerned about transporting her 6,000 miles at her age. But, when the veterinarians examined her, they felt she deserved this chance – and so did we. 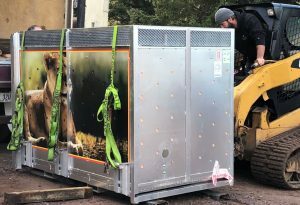 She was the first lion unloaded from the transport trailer after the long journey. And nothing sounded sweeter than hearing her roaring. She was announcing her arrival. She loves her indoor and outdoor den areas, and settled in right away for a comfy nap in her fresh straw beds. It’s nice to know the last chapter of her life will be her best. If you’d like to be Salteña’s sponsor parent, that would be such an amazing thing to do for this special lady. Find out how HERE.